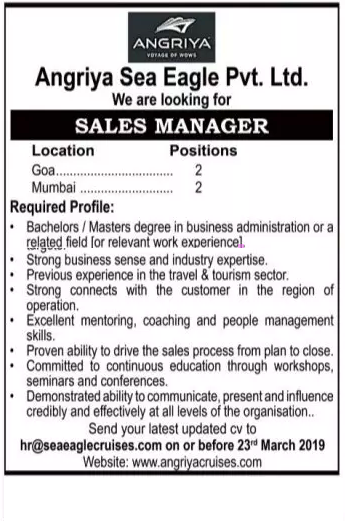 Angriya Sea Eagle Mumbai (Angriya Sea Eagle Pvt Ltd), Mumbai published a new job notification for Sales Manager Posts. The recruitment is for total 04 Vacancies. The willing candidates are informed to see the latest notification March 2019. Qualification required Bachelors/ Master Degree and More. Last Date of Online application is 23-03-2019. For More details of Angriya Sea Eagle Mumbai Recruitment 2019 Read Below. Education Qualification: Bachelors/ Master Degree and More. For Post wise Education Details follow the detailed advertisement. Application starts Online 19-03-2019. Last Date of application is 23-03-2019.